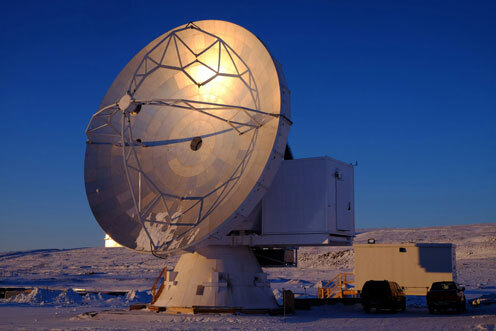 Scientists from the Niels Bohr Institute, University of Copenhagen, will soon be able to participate in the “Event Horizon Telescope” (EHT) with the Greenland Telescope (GLT). The GLT will become part of a global network of radio telescopes designed to get the first images of black holes. It’s hard to get an image of a black hole. They are the darkest objects in the universe because their gravity is so intense that no light can escape them, and their tremendous density makes them very small in spite of their enormous mass. To overcome these problems, the experiment is targeting much larger black holes than normal, namely so-called supermassive black holes, millions or billions of times more massive than the sun, as well as distributing the network of telescopes across the Globe to maximise the resolution of the image. It is possible to detect the black hole because the EHT can image the “shadow” of the black hole against a bright background of hot material near it. While black holes have been theoretically expected for the best part of a century, the first conclusive evidence for the existence of black holes was only obtained in 2015, when gravitational waves from a merger of two (smaller) black holes were detected. However, so far, no one has ever managed to get an image of a black hole because they are so small and so dark. In the center of almost every galaxy in the Universe there is a compact and supermassive object that astronomers believe to be supermassive black holes, vastly more massive than the merging black holes detected in 2015. But the final evidence is still lacking that these concentrations of mass in the hearts of galaxies are actually black holes. By detecting and creating an image of the black hole, viewed in contrast against the powerful radiation from the gas being drawn into the hole, researchers can confirm that the compact object doesn’t have a surface to reflect any light, and that light behaves in the warped way that we expect from the theory of general relativity near a black hole and its strong gravitational field. A press conference was held at DTU Space on Wednesday 10. April, where the first results from the EHT consortium were presented. With the addition of the Greenland Telescope, the precision and sensitivity of the images will substantially increase, and at the same time, Danish researchers will gain access to the EHT. “ It is fascinating to know that our generation is not only the first to learn, via detections of gravitational waves, that black holes really exist. We will also be the first to see what they look like!” says Marianne Vestergaard, associate professor at DARK, the Niels Bohr Institute and she continues: “We, the researchers, are thrilled. 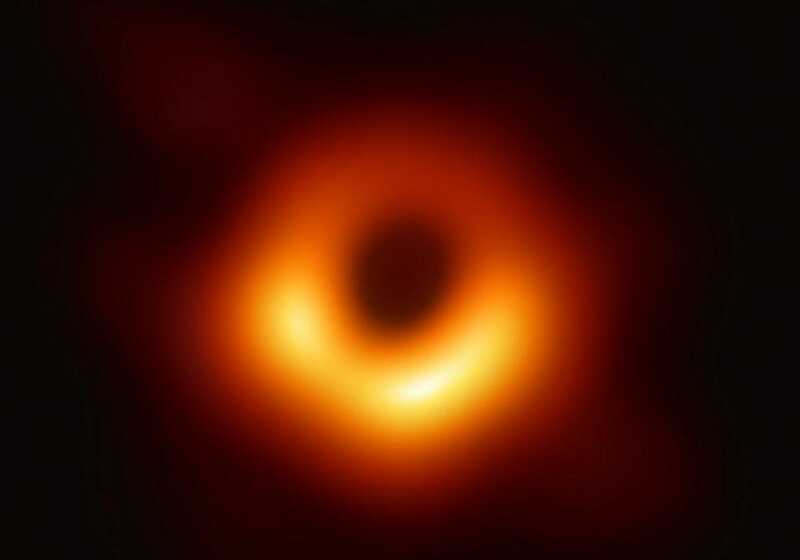 These excellent results from the Event Horizon Telescope show us the remarkable things that a dedicated, global collaboration can achieve, and it reveals the great potential there is for exploring the complex parts of our universe of which black holes are a manifest. It is particularly enjoyable that we, the Danish researchers, will be able to contribute to this new type of telescope on the front line. Greenland Telescope will be moved to the Summit of the ice sheet, reaching an altitude of approx. 3000 meters above sea level. The air is much drier, and the clear, dry and cold climate will offer better observing conditions compared to the humid air along the coast. The complicated task of moving the telescope across the ice is planned to take place during the summer of 2021. Researchers from the Niels Bohr Institute’s Physics of Ice, Climate and Earth section are assisting in that operation. 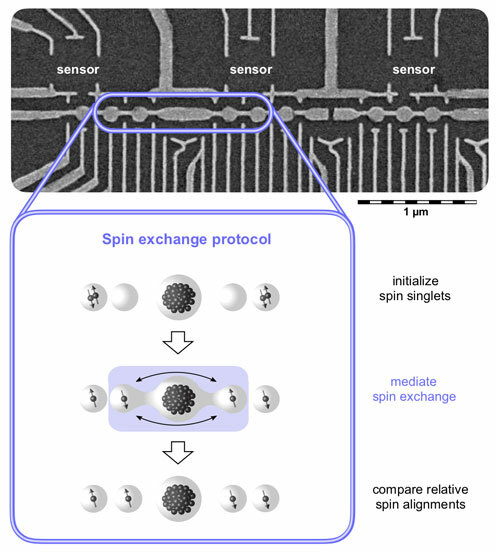 Tags: Nanotechnology ( 367 ), Niels Bohr Institute, Quantum Computing ( 121 ), Quantum information can be stored and exchanged using electron spin states., Quantum Physics ( 46 ), Size matters in quantum information exchange even on the nanometer scale, The collaboration between researchers with diverse expertise was key to success., Two correlated electron pairs were coherently superposed and entangled over five quantum dots constituting a new world record within the community. A gamma-ray burst registered in December of 2017 turns out to be “one of the closets GRBs ever observed”. The discovery is featured in Nature [co-authors are: Jonathan Selsing, Johan Fynbo, Jens Hjorth and Daniele Malesani from the Niels Bohr Institute, Giorgos Leloudas from the Technical University of Denmark and Kasper Heintz from University of Iceland] – and it has yielded valuable information about the formation of the most luminous phenomenon in the universe. Scientists from the Niels Bohr Institute at the University of Copenhagen helped carrying out the analysis. Jonatan Selsing frequently receives text messages from a certain sender regarding events in space. It happens all around the clock, and when his cell phone goes ‘beep’ he knows that yet another gamma-ray burst (GRB) notification has arrived. Which, routinely, raises the question: Does this information – originating from the death of a massive star way back, millions if not billions of years ago – merit further investigation? “GRBs represent the brightest phenomenon known to science – the luminous intensity of a single GRB may in fact exceed that of all stars combined! And at the same time GRBs – which typically last just a couple of seconds – represent one of the best sources available, when it comes to gleaning information about the initial stages of our universe”, explains Jonatan Selsing. He is astronomer and postdoc at Cosmic Dawn Center at the Niels Bohr Institute in Copenhagen. And he is one of roughly 100 astronomers in a global network set up to ensure that all observational resources needed can be instantaneously mobilized when the GRB-alarm goes off. The alarm sits on board the international Swift-telescope which was launched in 2004 – and has orbited Earth ever since with the mission of registering GRBs. Is there reason to assume that this specific GRB is of such importance that we should ask the VLT-telescope in Chile to immediately take a closer look at it? Or should we consider the information from Swift sheer routine, and leave it at that? On December 5th 2017 – just around 09 o’clock in the morning Copenhagen time – the GRB-alarm went off. Luca Izzo, Italian astronomer, was on duty – and Izzo did not harbor the slightest doubt: He right away alerted VLT – the Very Large Telescope in Chile – which is run by 11 European countries, including Germany, Great Britain, Italy, France, Sweden and Denmark. At that time it was early in the morning in Chile – 05 o’clock – and dawn was rapidly approaching, tells Jonatan Selsing: “For VLT to take a closer look at the GRB, action had to be taken immediately – since the telescope is only capable of working against a background of the night sky. And fortunately this was exactly what happened, when Izzo contacted VLT”. “Not least because this is one of the closest GRBs ever observed. GRB171205A – which has since become the official name of this gamma-ray burst – originated a mere 500 million years ago, and has ever since traveled through space at the speed of light, i.e. at 300.000 kilometer per second”. Working closely with a number of his colleagues at the Niels Bohr Institute, Jonatan Selsing contributed to the Nature-article with an analysis which – put simply – represents “a glimpse” of the very engine behind a gamma-ray burst. When a massive star – rotating at very high speed – dies, its core may collapse, thus creating a so-called black hole. A massive star may weigh up to 300 times more than the Sun, and due to combustion the star is transforming light elements to heavier elements. This process, which takes place in the core, is the source of energy not only in massive stars, but in all stars. Ashes – the by-product of combustion – may over time become such a heavy load that a massive star can no longer carry its own weight, which is why it finally collapses. When that happens, the outer layers will gradually fall towards the core – towards the black hole – at which point a disc is formed. Due to the star’s rotation, the disc will function as a dynamo creating a gigantic magnetic field – which will emit two jets, both going away from the black hole at a velocity close to the speed of light. During this process, the dying star is also releasing – spewing – matter, which lightens up with extreme intensity. This light is the very gamma-ray burst – the GRB itself. And the matter which is released from the center of the star is set free in the form of a so-called jet cocoon. “One of the unique features of GRB171205A is that it proved possible to determine which elements this gamma-ray burst released via the jet cocoon 500 million years ago. That was measured here at the Niels Bohr Institute, and that is our contribution to the Nature-article. These measurements were carried out via X-shooter – an extremely sensitive piece of equipment mounted on the VLT-telescope”, says Jonatan Selsing. “This corresponds with our theoretical expectations – and therefore also corroborates our model for a star-collapse of this magnitude. Being able to establish that it actually did happen in this way is, however, really special. That’s when you get a glimpse of the very engine behind a gamma-ray burst”. Scientists from the Niels Bohr Institute, University of Copenhagen, and their colleagues from the international ALICE collaboration recently collided Xenon nuclei, in order to gain new insights into the properties of the Quark-Gluon Plasma (the QGP) – the matter that the universe consisted of up to a microsecond after the Big Bang. The QGP, as the name suggests, is a special state consisting of the fundamental particles, the quarks, and the particles that bind the quarks together, the gluons. 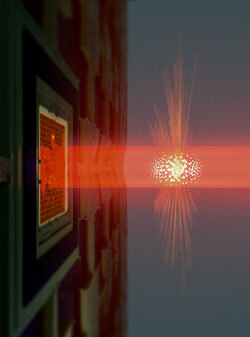 The result was obtained using the ALICE experiment at the 27 km long superconducting Large Hadron Collider (LHC) at CERN. The result is now published in Physics Letters B. Fig. 1 [Left] An event from the first Xenon-Xenon collision at the Large Hadron Collider at the top energy of the Large Hadron Collider (5.44 TeV ) registered by ALICE [credit: ALICE]. Every colored track (The blue lines) corresponds to the trajectory of a charged particle produced in a single collision; [Right] formation of anisotropic flow in relativistic heavy-ion collisions due to the geometry of the hot and dense overlap zone (shown in red color). The particle physicists at the Niels Bohr Institute have obtained new results, working with the LHC, replacing the lead-ions, usually used for collisions, with Xenon-ions. Xenon is a “smaller” atom with fewer nucleons in its nucleus. When colliding ions, the scientists create a fireball that recreates the initial conditions of the universe at temperatures in excess of several thousand billion degrees. 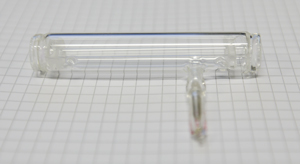 In contrast to the Universe, the lifetime of the droplets of QGP produced in the laboratory is ultra short, a fraction of a second (In technical terms, only about 10-22 seconds). Under these conditions the density of quarks and gluons is very large and a special state of matter is formed in which quarks and gluons are quasi-free (dubbed the strongly interacting QGP). The experiments reveal that the primordial matter, the instant before atoms formed, behaves like a liquid that can be described in terms of hydrodynamics. “One of the challenges we are facing is that, in heavy ion collisions, only the information of the final state of the many particles which are detected by the experiments are directly available – but we want to know what happened in the beginning of the collision and first few moments afterwards”, You Zhou, Postdoc in the research group Experimental Subatomic Physics at the Niels Bohr Institute, explains. “We have developed new and powerful tools to investigate the properties of the small droplet of QGP (early universe) that we create in the experiments”. They rely on studying the spatial distribution of the many thousands of particles that emerge from the collisions when the quarks and gluons have been trapped into the particles that the Universe consists of today. This reflects not only the initial geometry of the collision, but is sensitive to the properties of the QGP. It can be viewed as a hydrodynamical flow.” The transport properties of the Quark-Gluon Plasma will determine the final shape of the cloud of produced particles, after the collision, so this is our way of approaching the moment of QGP creation itself”, You Zhou says. The degree of anisotropic particle distribution – the fact that there are more particles in certain directions – reflects three main pieces of information: The first is, as mentioned, the initial geometry of the collision. The second is the conditions prevailing inside the colliding nucleons. The third is the shear viscosity of the Quark-Gluon Plasma itself. Shear viscosity expresses the liquid’s resistance to flow, a key physical property of the matter created. “It is one of the most important parameters to define the properties of the Quark-Gluon Plasma”, You Zhou explains, “ because it tells us how strongly the gluons bind the quarks together “. 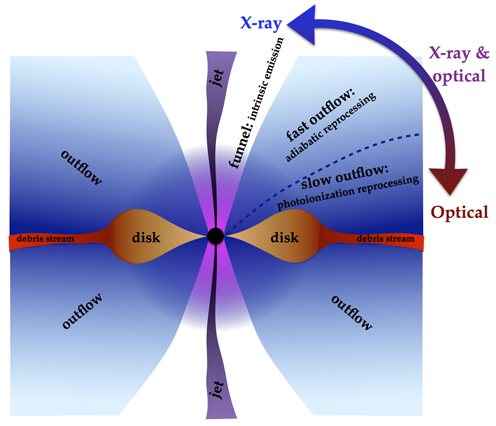 “With the new Xenon collisions, we have put very tight constraints on the theoretical models that describe the outcome. No matter the initial conditions, Lead or Xenon, the theory must be able to describe them simultaneously. If certain properties of the viscosity of the quark gluon plasma are claimed, the model has to describe both sets of data at the same time, says You Zhou. The possibilities of gaining more insight into the actual properties of the “primordial soup” are thus enhanced significantly with the new experiments. The team plans to collide other nuclear systems to further constrain the physics, but this will require significant development of new LHC beams. “This is a collaborative effort within the large international ALICE Collaboration, consisting of more than 1800 researchers from 41 countries and 178 institutes”. You Zhou emphasised. Gravitational wave detectors: Niels Bohr Institute scientists are convinced they can expand space surveillance using a small glass cell filled with caesium atoms. Gravitational wave detectors are extremely sensitive and can e.g. register colliding neutron stars in space. Yet even higher sensitivity is sought for in order to expand our knowledge about the Universe, and the NBI-scientists are convinced that their equipment can improve the detectors, says Professor Eugene Polzik: “And we should be able to show proof of concept within approximately three years”. If the NBI-scientists are able to improve the gravitational wave detectors as much as they “realistically expect can be done”, the detectors will be able to monitor and carry out measurements in an eight times bigger volume of space than what is currently possible, explains Eugene Polzik: “This will represent a truly significant extension”. Polzik is head of Quantum Optics (Quantop) at NBI and he will spearhead the development of the tailor made equipment for gravitational wave detectors. The research – which is supported by the EU, the Eureka Network Projects and the US-based John Templeton Foundation with grants totaling DKK 10 million – will be carried out in Eugene Polzik’s lab at NBI. News media all over the world shifted into overdrive in October of 2017 when it was confirmed that a large international team of scientists had indeed measured the collision of two neutron stars; an event which took place 140 million light years from Earth and resulted in the formation of a kilonova. The international team of scientists – which also included experts from NBI – was able to confirm the collision by measuring gravitational waves from space – waves in the fabric of spacetime itself, moving at the speed of light. The waves were registered by three gravitational wave detectors: the two US-based LIGO-detectors and the European Virgo-detector in Italy. “These gravitational wave detectors represent by far the most sensitive measuring equipment man has yet manufactured – still the detectors are not as accurate as they could possibly be. And this is what we intend to improve”, says Professor Eugene Polzik. “We are convinced this will work as intended. Our calculations show that we ought to be able to improve the precision of measurements carried out by the gravitational wave detectors by a factor of two. And if we succeed, this will result in an increase by a factor of eight of the volume in space which gravitational wave detectors are able to examine at present”. 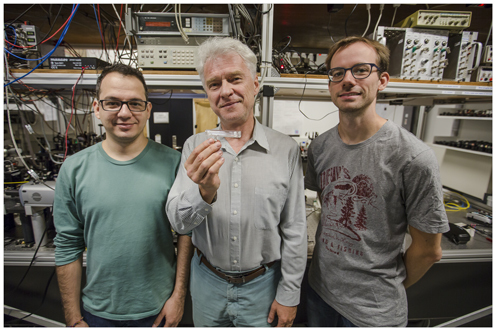 In July of last year Eugene Polzik and his team at Quantop published a highly noticed article in Nature – and this work is actually the very foundation of their upcoming attempt to improve the gravitational wave detectors. The article in Nature centered on ‘fooling’ Heisenberg’s Uncertainty Principle, which basically says that you cannot simultaneously know the exact position and the exact speed of an object. This has to do with the fact that observations conducted by shining light on an object inevitably will lead to the object being ‘kicked’ in random directions by photons, particles of light. This phenomenon is known as Quantum Back Action (QBA) and these random movements put a limit to the accuracy with which measurements can be carried out at the quantum level. The article in Nature in the summer of 2017 made headlines because Eugene Polzik and his team were able to show that it is – to a large extent – actually possible to neutralize QBA. And QBA is the very reason why gravitational wave detectors – that also operate with light, namely laser light – “are not as accurate as they could possibly be”, as professor Polzik says. Put simply, it is possible to neutralize QBA if the light used to observe an object is initially sent through a ‘filter’. This was what the article in Nature described – and the ‘filter’ which the NBI-scientists at Quantop had developed and described consisted of a cloud of 100 million caesium atoms locked-up in a hermetically closed glass cell just one centimeter long, 1/3 of a millimeter high and 1/3 of a millimeter wide. The principle behind this ‘filter’ is exactly what Polzik and his team are aiming to incorporate in gravitational wave detectors. “Switching to stronger laser light will just make a set of mirrors in the detectors shake more because Quantum Back Action will be caused by more photons. These mirrors are absolutely crucial, and if they start shaking, it will in fact increase inaccuracy”. Instead, the NBI-scientists have come up with a plan based on the atomic ‘filter’ which they demonstrated in the Nature article: They will send the laser light by which the gravitational wave detectors operate through a tailor made version of the cell with the locked-up atoms, says Eugene Polzik: “And we hope that it will do the job”. Neutron stars are small, but extremely dense objects, only tens of kilometers across, but with the mass of a star. When they collide or merge, they produce enormous amounts of energy. It has been believed for some time that they are responsible for short bursts of gamma rays, a celestial phenomenon first discovered in the 1960s by cold war nuclear monitoring satellites. 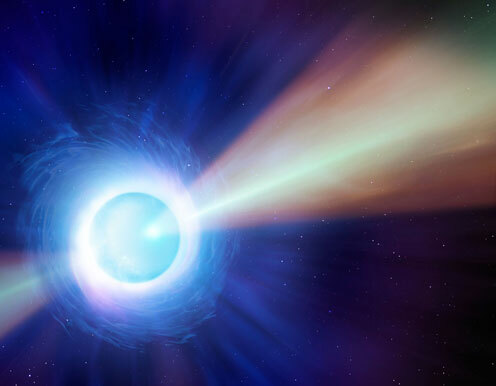 This new finding establishes that link much more clearly, and opens the way to use the hundreds of known short gamma ray bursts to study the mergers of neutron stars – so far, very rare phenomena. What exactly is a “short duration gamma ray burst”? Gamma ray bursts, we know now, are the signatures of extremely violent merger of two neutron stars. A quick burst of gamma rays is emitted milliseconds after the collision, and the bursts are observable from Earth. Hundreds of bursts have been detected to date, but it hasn’t been possible to conclusively link the observations to a source. The present study has used a now famous celestial event in 2017, to link such a burst to the merger of a neutron star. It made headlines when the gravitational wave event of 17 August 2017 – hence the name GW170817 – became the first gravitational waves to be positively identified with an astrophysical source — a neutron star merger. In ongoing investigations of the event, a team of scientists, including members from the Niels Bohr Institute, continued to monitor the source, and were rewarded with the first, confirmed sighting of a jet of material, the afterglow, still streaming out from the event. The gravitational wave detection provides a wealth of unprecedented data: the masses of the merging objects, how they spin, the final mass of the merged remnant. However, light emitted at different frequencies from the event is also critical to understanding the merger. And there are two different sources of light, each of which provides unique information. The first is the prompt emission of high energy radiation lasting only milliseconds, which comes out immediately – in this case 1.7 seconds after the gravitational wave signal – the gamma ray burst. The second, the kilonova, emerges in the subsequent days, and has a much slower emission of optical and infrared light, which rises, and then fades. Currently, this is believed to be a radioactive fireball of ejected matter from the neutron star merger. GW170817 produced a gamma ray burst believed by some to have been dim because the earth was off the main axis. This study shows that the merger did indeed launch a jet, which we observed off-axis, and which was distinguishable from the optical light from the kilonova. This was done by detecting visible light from the afterglow months after the merger, characteristic of jet emission rather than kilonova emission. 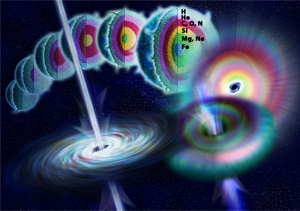 This provides the link between the jet-driven short gamma ray bursts and a neutron star merger. So now, the framework for understanding both GW170817 and hundreds of formerly “homeless” observations of short duration gamma ray bursts is far better established. Of particular interest is the question of the origin of the heaviest elements, which is still a matter of serious debate among scientists, with many now believing that the rare earth elements, as well gold and platinum, are created in these mergers and scattered into the universe. While the signature of such elements has yet to be clearly identified, as a result of this study, it may now be possible to get a better census of the number of neutron star mergers happening in the universe by using short gamma-ray bursts. Statistics for this much larger group of events may make it possible to work backwards and perhaps establish the properties of neutron star mergers as a whole. 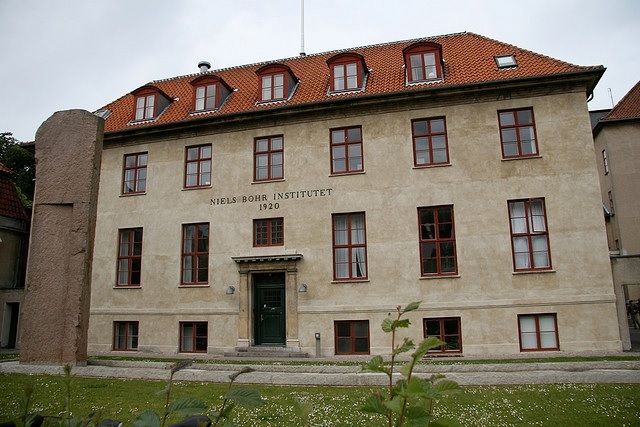 Jens Hjorth, Johan Fynbo, Christa Gall, Bo Milvang-Jensen, and Darach Watson of the Niels Bohr Institute were involved in the publication, and their work supported by the Villum Foundation and the Carlsberg Foundation. Juliane Maries Vej 30, 2100 København Ø.
Spectra of the afterglow from GRB 180325A taken with the NOT and the ESO/VLT X-shooter. 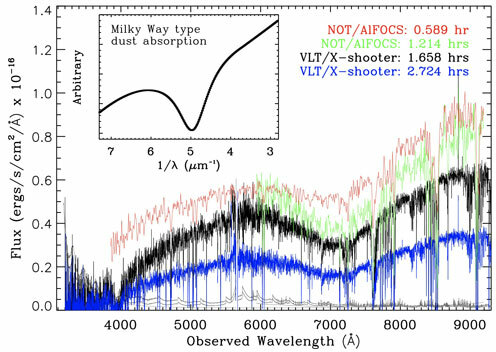 The dust bump is seen as the downward bulge, which is in the spectrum around 7000 Å. For comparison, you can see the Milky Way dust bump in the small inset to the left. Credit: Tayyaba Zafar (AAO) et al. The carbonaceous dust is registered in the measurements as a “dust bump”, that is, a high value of dust with the said composition. This ultraviolet dust bump has now been detected in a gamma-ray burst, which has been named GRB180325A and the result has just been accepted for publication in the journal The Astrophysical Journal Letters. The lead author is Tayyaba Zafar who completed her PhD studies at the Niels Bohr Institute in Copenhagen and is now working at the Angle Australian Observatory in Australia. Several other researchers from NBI are co-authors of the article. Dr. Jane Lixin Dai, theoretical astrophysicist and assistant professor and Prof. Enrico Ramirez-Ruiz, both from the DARK Cosmology Center at the Niels Bohr Institute, University of Copenhagen, have recently provided the scientific community with a much-needed computer model. It is necessary for the investigation of Tidal Disruption Events – rare, but extremely forceful events taking place in the center of galaxies. 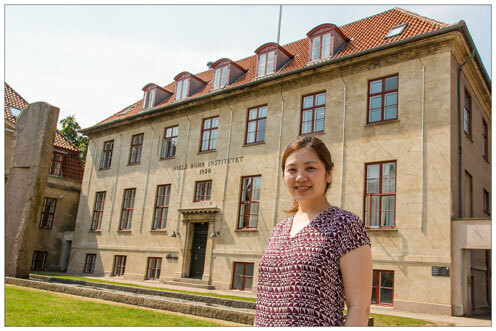 Jane Lixin Dai, theoretical astrophysicist at DARK Cosmology Centre and Niels Bohr International Academy at the Niels Bohr Institute, University of Copenhagen, has long wanted a computer model that makes it possible to calculate black hole properties. This work has been made possible by the collaboration between Dr. Jane Dai from the DARK Cosmology Centre at the Niels Bohr Institute (NBI), Prof. Enrico Ramirez-Ruiz from both NBI and the University of California at Santa Cruz (UCSC), as well as researchers from the University of Maryland: Prof. Jonathan McKinney, Dr. Nathaniel Roth, and Prof. Cole Miller. In particular, state-of-the-art computational tools were employed to solve the puzzle. These simulations were carried out by Dr. Dai and Dr. Roth, on the recently acquired large computer cluster made possible by the Villum Grant from Professor Jens Hjorth, head of DARK Cosmology Centre, as well as clusters funded by NSF and NASA. A major challenge for future quantum computers is that you have to keep the quantum information long enough to make calculations on it – but the information only has a very short lifespan, often less than a microsecond. Now researchers at the Niels Bohr Institute and the Department of Chemistry at the University of Copenhagen, in collaboration with a team of international researchers, have come closer to a solution. The results are published in the renowned journal Nature Communications. 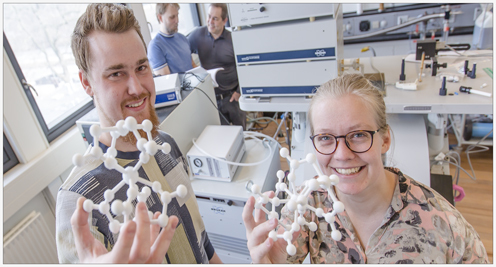 PhD student Mikkel Agerbæk Sørensen from the Department of Chemistry and Postdoc Ursula Bengård Hansen from the research group X-ray and Neutron Science at the Niels Bohr Institute shows a 3D model of the studied molecule. By making small changes in the form of the molecule, the tunnelling can be suppressed. In the background Associate Professor Kim Lefmann and Professor Jesper Bendix. Photo: Ola J. Joensen. In order to build the quantum computer of the future, you need to be able to store the quantum information – what we call “quantum bits” or “qubits” – (which corresponds to bits and bytes in a traditional computer). Several research groups are experimenting with different ideas for how this can be done in practice. A team of chemists and physicists from the Niels Bohr Institute and the Department of Chemistry at the University of Copenhagen, as well as collaborators from Germany, France, Switzerland, Spain and the United States, have studied the possibility of producing qubits from organometallic molecules with a single magnetic ion in each molecule. 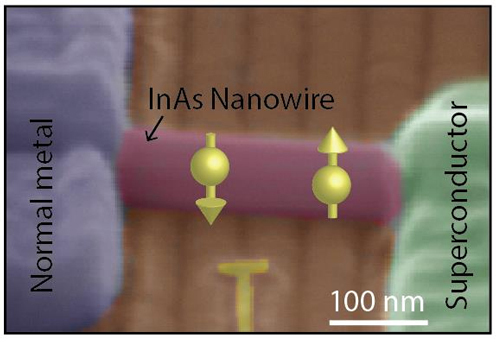 In these “nanomagnets” there is the particular challenge that random movements in the outside world can interfere with the magnetic ions, so that the quantum information is lost before you can manage to perform calculations with it. Even at ultra-low temperatures just above absolute zero (0.05 Kelvin), where all motion “normally” stops, the system can still be subjected to quantum mechanical disturbances, also known as “tunnelling”. There is still a long way to go to be able to use these nanomagnets in a practical quantum computer, but the researchers have now discovered another “control lever”, namely the geometric form of the molecule that can be used to get closer to the goal. 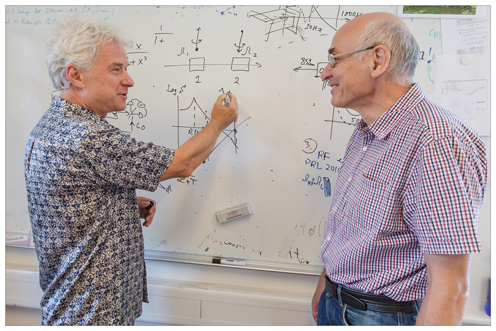 With the construction of the largest neutron facility (ESS) in Lund, Sweden, researchers will have better opportunities to measure and understand tunnelling, thus getting closer to controlling it – and ultimately pave the way for quantum computing. 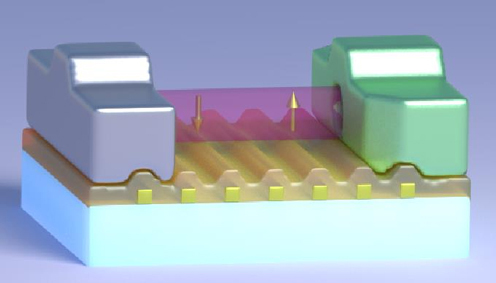 In order to understand the quantum behavior of a molecule-based magnet, it is necessary to measure the energy levels of the molecule very accurately. This is best done with the so-called inelastic neutron scattering. Such experiments can only be done using instruments located at major international research facilities. With the performance of ESS, researchers at the University of Copenhagen will have even better opportunities to conduct such studies. 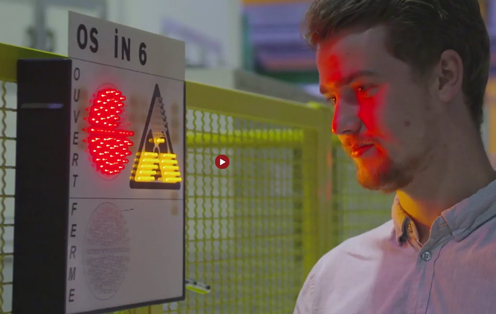 Here Mikkel Agerbæk Sørensen at the entrance of the instrument IN6 at the Institute Laue-Langevin in Grenoble.